It is more than two weeks before Syria’s June 3 Presidential election, but State media are already promoting a victory for President Assad. An oratorical festival was organized near Shamdeen Square in Rukneddin neighborhood (in Damascus), with participants expressing support to presedential candidate Dr. Bashar al-Assad as the candidate who is capable of building Syria and restoring security. 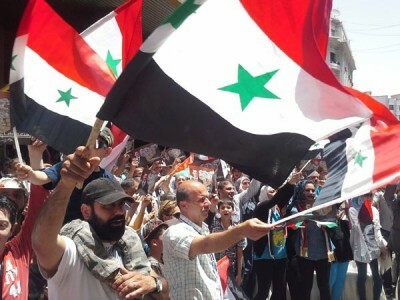 The participants said that Syria will remain impregnable in the face of its enemies, and that it will continue to combat terrorism and takfiri mentality, asserting that Syrians form a unified society, and calling upon all Syrians to vote in the elections. Arab university students studying at faculties in Hama organized a stand in the yard of the dormitory with popular, party and official participation…. The participants stressed their support for presidential candidate Dr. Bashar al-Assad, hailing the “pioneering” achievements that were made under his leadership in the various political, economic, social and cultural fields. There is no mention in the article of the two nominal challengers to Assad, businessman and former Minister of State Hassan al-Nouri and MP Maher Najjar. A “security official” has said that the head of Syria’s air defence forces, General Hussein Isaac, has been killed in fighting in the key Damascus suburb of Mleha. Regime forces have tried for months to re-capture Mleha, a gateway to the East Ghouta region. The Syrian military responded with airstrikes to disrupt the insurgent advance. United Nations Secretary-General Ban Ki-moon has said that the cut-off of water to civilians in Aleppo is a “clear breach” of international law. The regime and insurgents have blamed each other for the recent halt of supplies for almost two weeks. See Is An Insurgent Cut-Off Adding to Water Crisis in Aleppo? The regime said insurgents had halted operations of an electricity station needed for water delivery. The Islamic Front and opposition activists said the break in supply came after regime shelling of electrical and water facilities, with Syrian authorities delaying essential repairs at a pumping station.